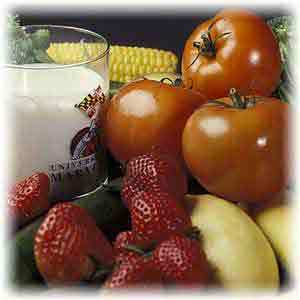 Home » Ask The Trainer Blog » Nutrition » Artificial Food Dyes: What’s the Buzz? What is a food dye? If you’ve ever paid attention to the ingredient section of the food products you purchase in the grocery store, you’ve probably noticed that you’ve never heard of several of the ingredients. It’s also likely that you’ve wondered why there were so many colors such as Yellow 6, Blue 1, or Red 40 in a seemingly innocent box of cereal. Why does the food industry use food dyes? Food industries are interested in using food dyes because they can replace healthy ingredients and are cheaper than the real food item. For example, it is easier and cheaper for someone to create a blueberry flavored liquid, color it blue, and label it blueberry juice than it is for someone to actually extract juice from several blueberries. 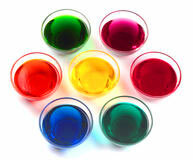 Food dyes have the ability to make products look fresh. Consumers are more likely to purchase fresh food because they can tell the difference between something that is fresh and something that has been sitting around for a long time. The food industry knows this and takes this into account for any of the products they are selling. They implement food coloring as a way to make foods appear fresh. How do food dyes benefit consumers? Food dyes allow consumers to identify certain flavors more quickly because our brains draw associations with what we know to be true. Imagine if orange flavored candies were green and if blue colored candies were cherry flavored. It’s certain we would all be confused. Coloring foods in coordination to flavor creates a sense of uniformity and predictability across most food products. This is good for consumers because they can pick up a bag of orange colored candy and make a purchase decision based on their preference for the orange flavor. What kinds of foods use artificial food dyes? 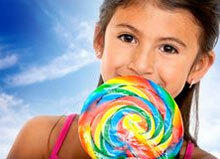 How do food dyes affect children? 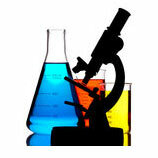 Actual quantities of neurotoxic chemicals found in foods have not been revealed until recent studies were released. Unfortunately, many children are consuming more dyes than the minimum amount needed to cause behavioral problems. As with most nutritional concepts, the cumulative effect of continual dyed food consumption should be of a concern to those with children as it is children that generally consume these types of foods in large quantities. With the increase in consumption of processed foods came the increase in food dye consumption and a subsequent increase in behavioral problems detected in children. A study by the Center for Science in the Public Interest stated that the nine artificial dyes approved in the United States likely are carcinogenic, cause hypersensitivity reactions and behavioral problems, or are inadequately tested.5 The FDA has since then acknowledged that food dyes have indeed played a role in the increased incidence of behavioral problems in some children, but have yet to take action against these types of problems. Do artificial food dyes affect adults? Though food dyes still affect adults in a similar mechanism to the way children are affected, the detrimental effects are not as noticeable simply because adults will need to consume a larger quantity of food dyes before any adverse effects present themselves. However, this doesn’t mean that they don’t exist and that your body is left unharmed. Due to the mountain of increasing public concerns, a few large companies have taken action to remove dyes in some of their foods. General Mills has since removed dyes from Go-Gurt and Trix yogurt varieties. Frito-Lay has gotten rid of dyes in Sun Chips and a few other chip varieties. Unfortunately, there have yet to be any large movement or laws that prohibit the use of these food dyes in the United States. Chances are people are not going to consume food dyes in large quantities in one meal. 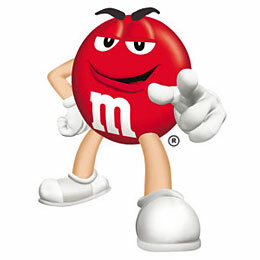 It is highly unlikely that someone is going to sit at their dining table drinking a giant barrel of Red 40; however, it is necessary to understand that the accumulation of food dye consumption over time can be dangerous, but it is of greater concern for kids because they are small in stature and still growing. The cumulative effect of consumption of food dyes over the course of each breakfast, lunch, snack, or dinner over time can have serious detrimental health effects. More research is needed to determine how the consumption of food dyes will affect the human body over a lifetime. In the meantime, try to reduce or eliminate food dyes from your diet if possible. 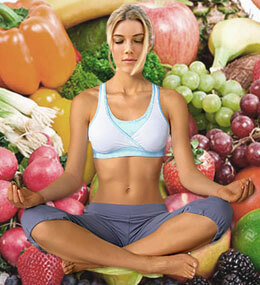 Your body will thank you in the future. 1. Walford, J. (1980). “Historical Development of Food Colouration”.Developments in Food Colours(London: Applied Science Publishers) 1: 1–25. 2. Peiperl MD, et al.Food Chem Toxicol.1995;33(10):829–839. doi: 10.1016/0278-6915(95)00051-3. 3. Stevens, L.J., Burgess, J.R., Stochelski, M.A., Kuczek, T. Amounts of Artificial Food Dyes and Added Sugars in Foods and Sweets Commonly Consumed by Children., Clinical Pediatrics, e-publ April 24, 2014. 4. MTA Cooperative Group, A 14-month randomized clinical trial of treatment strategies for attention-deficit hyperactivity disorder (ADHD)”.Archives of General Psychiatry 56: 1073–1086. 1999. 5. CSPI.Food Dyes: A Rainbow of Risks.Washington, DC: Center for Science in the Public Interest; 2010.